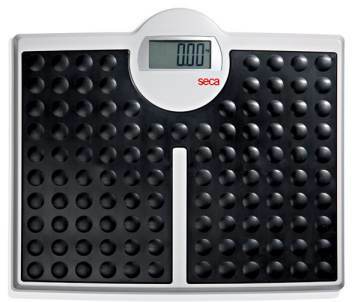 With its wide, low platform and non-slip dimpled mat, the seca 813 electronic flat scale with high capacity is easy and safe to mount also for older or handicapped patients. Due to its high capacity and stable integrated steel frame it is also ideal for weighing very heavy patients. 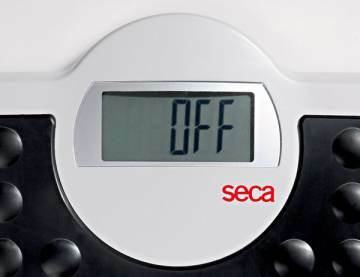 The practical step-off function means that the scales do not have to be switched on separately before use. The result is also extremely precise due to the automatic zero adjustment which takes into account any changes in the environment when changing location (for example the temperature or flooring). When one takes a holistic look at a person’s health, that person’s weight plays a central role. Excess weight involves the risk of suffering serious metabolic disorders such as high blood pressure and diabetes. Even a slight reduction in weight can help to reduce these risks significantly. The ideal field of application for the highly precise floor scale seca 813 Robusta is weight control in the medical sector. For the health-conscious person, it is also the ideal solution for one’s own home: it combines comfort, stability and safety. (435 mm) which is highly stable due to the integrated steel frame. Two good reasons why the floor scale is optimal for weighing heavyweight persons. The seca 813 combines safety and comfort: the scale can be mounted comfortably and safely due to the extremely low platform (47 mm high) and the non-slip, but pleasantly soft dimpled mat. Older people or persons with walking disability have no problem mounting this floor scale. At the same time, as it is made of a smooth and shockproof material, the platform is extremely hard-wearing, durable and easy to clean. To ensure that the measuring result can be recorded quickly and correctly, the seca 813 Robusta is equipped with an easy to read, 29 mm high LCD display. 17 x 1.8 x 14.6"